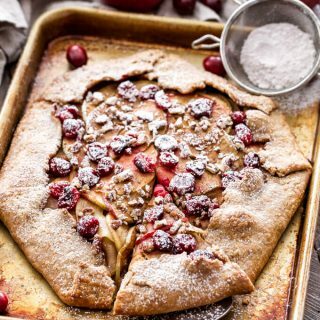 Do you have a favorite dessert? What is it? I don’t know if I can limit myself to one favorite dessert, there are so many decadent choices. I do however tend to favor desserts that aren’t chocolate. I know, I know how is that possible? It’s not that I don’t like chocolate, I do get a craving now and then for a big chewy brownie or a warm chocolate chip cookie. However, if I had a choice between those and a slice of coconut cream pie, a big bowl of ice cream, or a chunk of this amazing cake, I would have to choose the later. I got the idea for this cake from a fabulous food blog called Une Gamine dans la Cuisine. 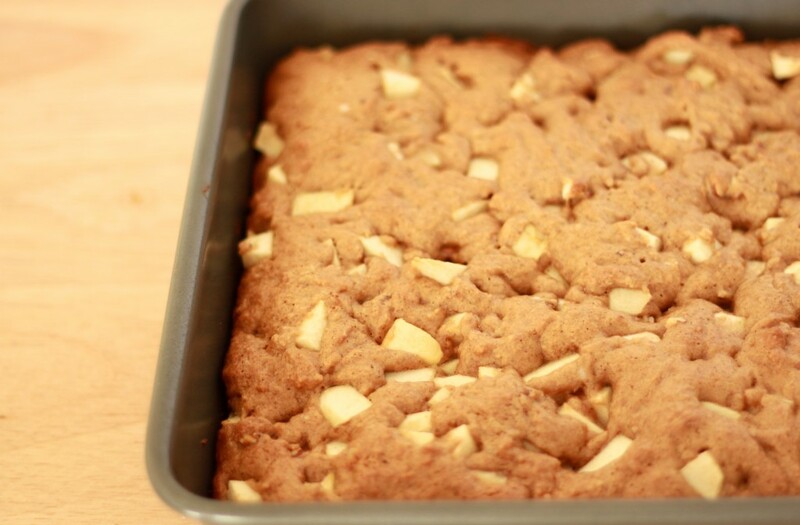 Her recipe for Chunky Apple Cake had me drooling. 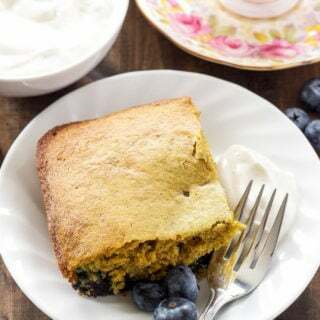 I thought I would make some changes to the recipe and make it a bit more figure friendly, maybe this way I can justify the chunk I ate before my real breakfast. 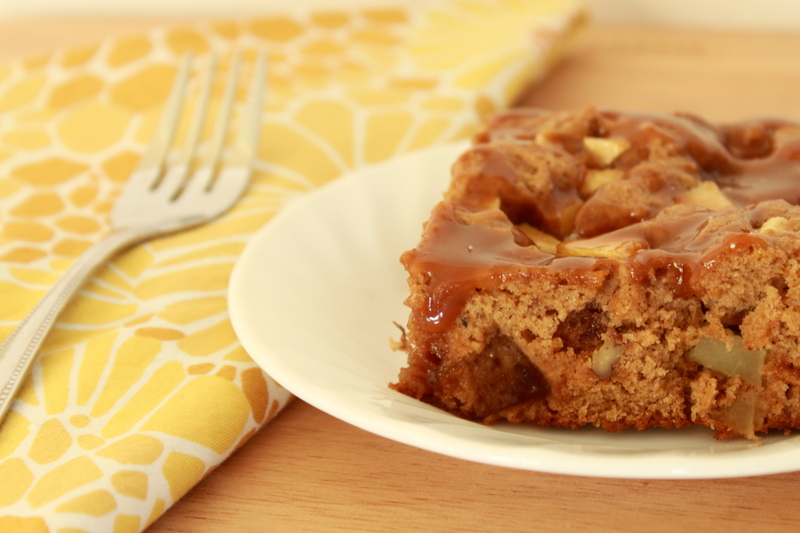 The salted caramel glaze on top of this cake is really what makes it extra special. 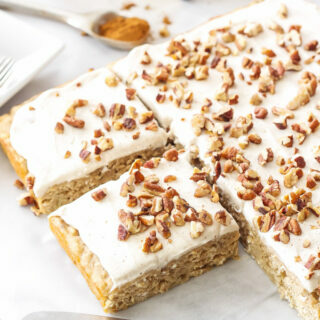 The caramel oozes into every pocket and crevice of the cake, giving you a salty and sweet bite with every forkful…I had many forkfuls. The salted caramel comes from another favorite website of mine called Two Peas and Their Pod.You could always buy store bought caramel sauce, but there is something magical and fulfilling about making your own. 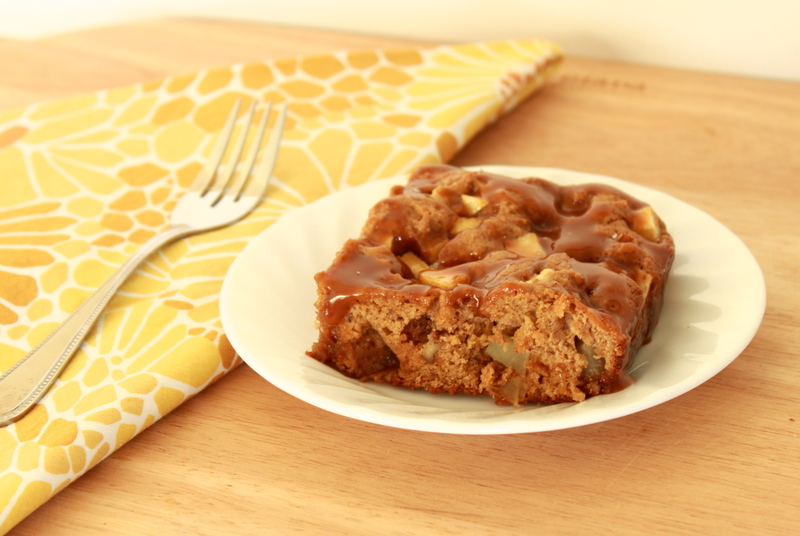 Head on over to their site for the salty sweet caramel recipe, trust me you won’t regret it! 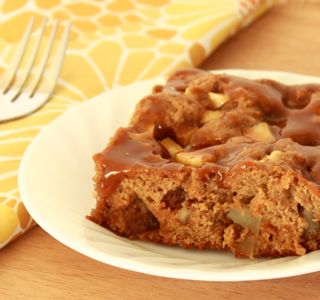 A moist, delicious cake filled with apples and pecans, topped with salted caramel glaze! Line the bottom of an 8x8 baking pan with parchment paper and lightly spray with cooking spray. 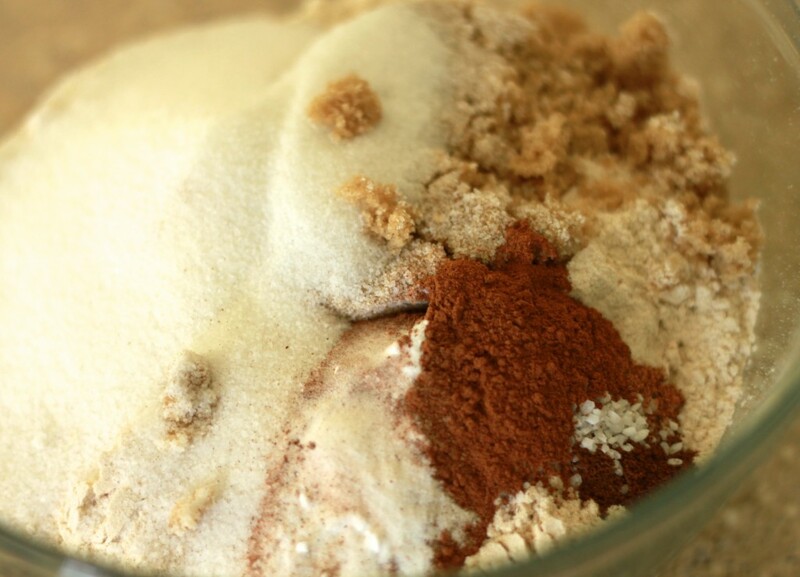 In a mixing bowl whisk together the flours, sugars, baking soda, cinnamon, nutmeg, and cloves. In a stand mixer with the paddle attachment beat the whole egg and egg white until frothy. Add the oil, applesauce, and almond extract to the eggs and beat on medium speed for another couple minutes. Add the flour mixture to the egg mixture and combine with a spatula. 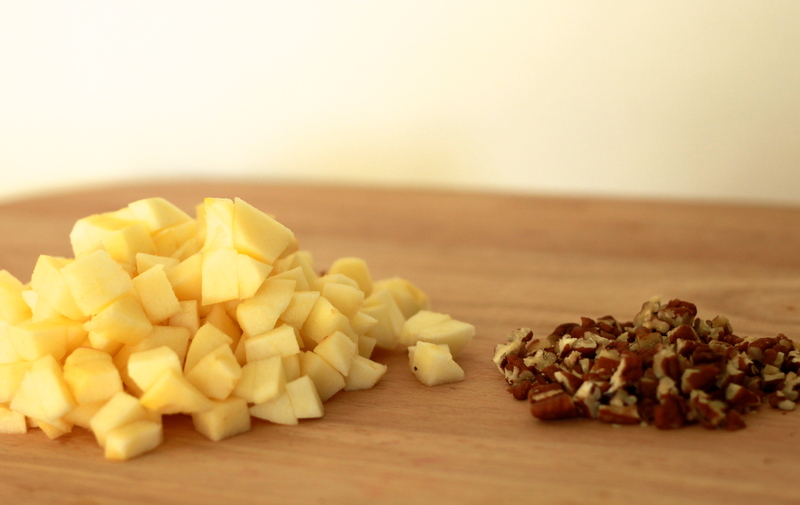 Fold in the diced apples and pecans. Spread the batter out evenly in the 8x8 pan and bake for 35-40 minutes or until an inserted toothpick comes out clean. Sprinkle the top with a pinch of fleur de sel salt.